Immediately after John Tory was elected as the 65th mayor of Toronto*, maps were produced in the media, similar to the one above, that advanced a narrative of a divided city. A city divided between the downtown and suburbs, divided by class and income, and by political leanings. The wisdom was that Ford Nation retreated to the northeast and northwest corners of the city, but remains still a potent political force. But mapping which mayoral candidate (John Tory, Doug Ford, or Olivia Chow) ‘won’ which ward completely misses the bigger picture. I started this website after I began producing maps of the local council races and ward-level results of the 2014 municipal election and sharing them on Twitter. This was something that I was doing entirely for my own interest, but was related to work I have done with Ryerson Professor Myer Siematycki for the Maytree Foundation studying voter turnouts in the last three municipal elections. Once the full official results were released by the City of Toronto, along with geographic files of poll locations and boundaries (as part of the city’s wonderful Open Data Initiative), it became possible to dig deeper than just looking at ward-level maps. I was pleased — and a bit surprised — by how popular my maps were. If one is simply interested in the mayoral race, this second map, below, is a bit more useful than the first one I posted. It shows each of the three candidates’ margin of win in each ward. I added the boundaries of the six former municipalities of Toronto, partly for geographic reference. One can see that John Tory’s centre of support in the last election was the Midtown wards of 16, 25, and 22; a largely (though by no means homogeneously) wealthy part of the city that includes Forest Hill, the Bridle Path, and the Lawrence Park neighbourhoods. Ford’s support was strongest in seven wards in the northwest (and one in the northeast). 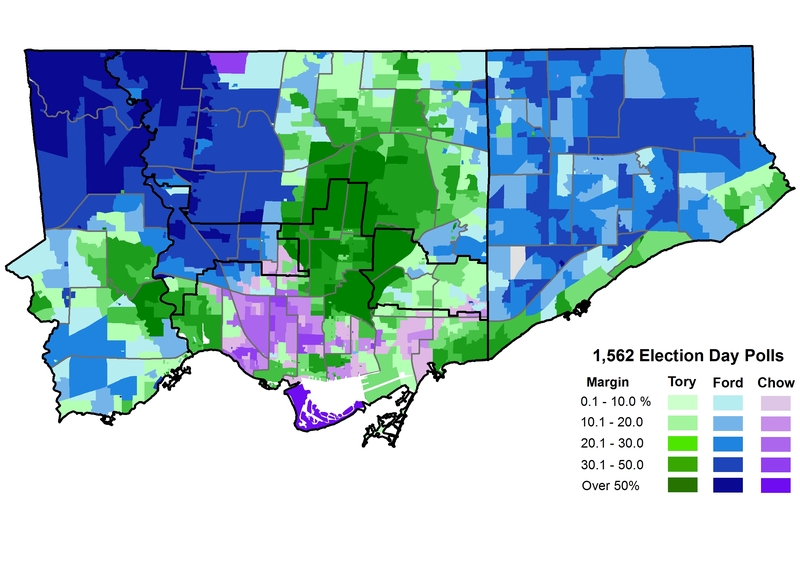 One can also clearly see that many suburban wards did not vote solidly for Doug Ford — John Tory was competitive in most wards that went blue. 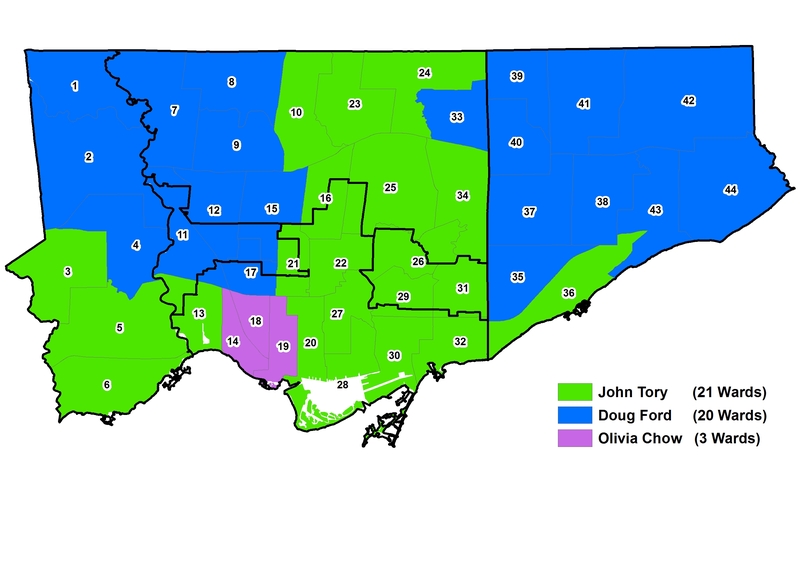 In all ‘Downtown’ wards (Wards 13, 14, 18, 19, 20, 27, 28, 30, and 32) Tory and third-place Olivia Chow came in either first or second place, with Ford a distant third. With a few exceptions, Chow fared poorly outside these 9 wards. With poll-level data, we can see how each of the 1,562 election day polls voted (the maps exclude the votes cast at advance polls), and this is where things become even more interesting. There are many polls that selected John Tory, but in wards that as a whole Doug Ford, and vice-versa. That big purple patch on the north end of Toronto surrounded by blue is Olivia Chow-voting York University. Tory’s support follows the shores of Lake Ontario, up Yonge Street to Steeles Avenue, and into some of Toronto’s wealthiest neighbourhoods, such as High Park, the Kingsway, Rosedale, Leaside, the Beach, and Forest Hill. During the next few weeks, I will post the ward level maps that I have been creating and sharing via Twitter. These maps show both the results mayoral race and the local councillor race in each ward. I’ll also share a few new maps as well. I also intend to examine the various relationships are between voting patterns and local demographics, though I will certainly not be the first to do so. Professor David Hulchanski at the University of Toronto offers great insights that link the effects of many years of social divisions with a divided voting pattern in 2014. 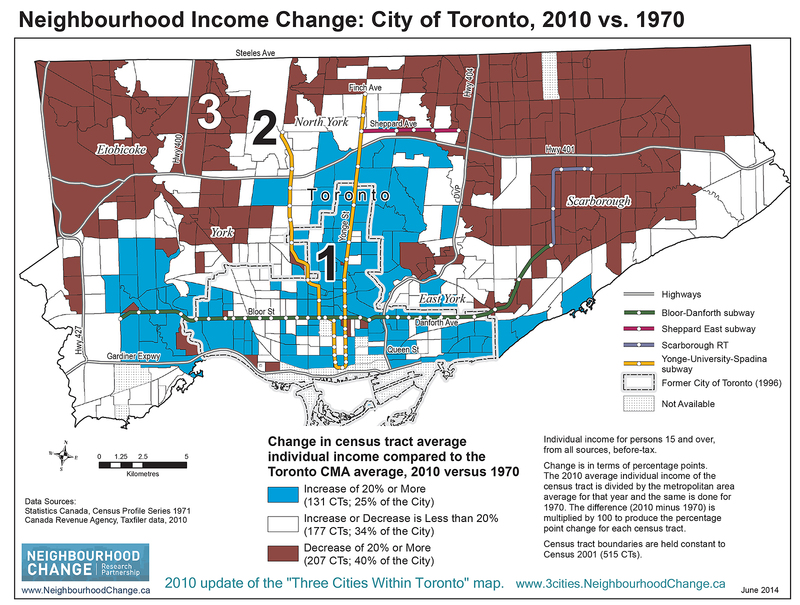 Tory’s electoral support does appear to parallel Prof. Hulchanski’s “City 1,” census tracts where individual incomes are generally rising compared to the city average. I’ll conclude this post by saying that the results of the 2014 municipal election are more interesting than you might expect and more complex than the simple theories about suburban/urban dichotomies and class and immigration. Though these reductionist explanations aren’t entirely without truth, there’s so much more to be said. * Yes, John Tory is the 65th mayor of Toronto if you start chronologically from William Lyon Mackenzie, appointed by Toronto City Council in 1834 when the City of Toronto was formed. It does not count the various mayors and reeves elected by smaller municipalities amalgamated into Toronto between 1834 and 1997 (villages and towns such as Parkdale, Brockton, West Toronto and Forest Hill) or the mayors of the five other local municipalities amalgamated with Toronto in 1997 to create the current City of Toronto. One former mayor, Frances Nunziata, of the City of York, is still on Toronto city council today. This entry was posted in Election, Maps and tagged 2014 Election. Bookmark the permalink.